You’ve probably been hearing about the new “myRA,” a new government-run retirement account that President Obama unveiled at his State of the Union address and plans to create with a stroke of his pen. Its primary purpose is to offer a savings option to the 50% or so of U.S. workers who have no access to employer-sponsored retirement plans and have little saved for retirement. The appeal is that it “guarantees a decent return with no risk of losing what you put in,” according to Obama. Sounds okay so far, right? I did some digging into the details to understand more about how this program will actually work… and to help you sort through the pros and cons of programs like this. Below I’ve listed the good, the bad, and the ugly about this new program. But really, most of the bad and the ugly points apply to all government-run retirement accounts, including 401(k)’s, 403(b)’s, IRA’s, etc. So if you have one of these plans, I urge you to read this today. Contributions are deducted from your after-tax pay, and withdrawals are not taxed. This is a good thing, if you believe tax rates will be going up over the long term. Though many people don’t think about this, if tax rates go up and you’re successful in growing a nest-egg, by deferring your taxes, you’re only going to end up paying higher taxes on a bigger number. First, at best, you’ll only keep up with inflation. And you won’t always do that. The G Fund has a current return of 1.47% – which is less than inflation. The second problem is that our government has been spending money like a drunken sailor and has been having a tougher time finding buyers for its bonds. It’s also scaling back on its own purchases of U.S. debt. This new plan would create a ready pool of buyers for those bonds – us! This is the same government that’s running the Social Security trust fund into the ground. And you wanna give them more of your hard-earned dollars? Oh, goodie! Now you’re back to figuring out what to invest it in, rolling the dice in the Wall Street Casino, and paying those high fees which can take a significant bite out of your savings! Recent studies have shown that fees in an IRA are often even higher than 401(k) fees. 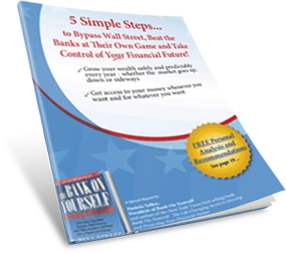 I get into the specifics on pages 116-120 of my new book, The Bank On Yourself Revolution: Fire Your Banker, Bypass Wall Street, and Take Control of Your Own Financial Future. What aren’t they telling us about this new plan that we’re going to find out about later? Hey, we were promised we could keep both our health-care plan and doctor if we like them. I’ve already gotten notice I can’t keep my plan (which I like), and my primary care (and favorite) doctor is no longer in the plan. So I think I’m justified in being suspicious. The myRA – just like 401(k)’s, 403(b)’s, and IRA’s – are government-approved and controlled plans. They can (and do) change the rules any time they want. And they always come with more strings attached than a puppet. Can you even make your own decisions regarding the money in your plan? Can you put in as much as you want and take out what you want when you want it? Do you have accurate projections about the value of your retirement fund so you can make intelligent decisions about your future? 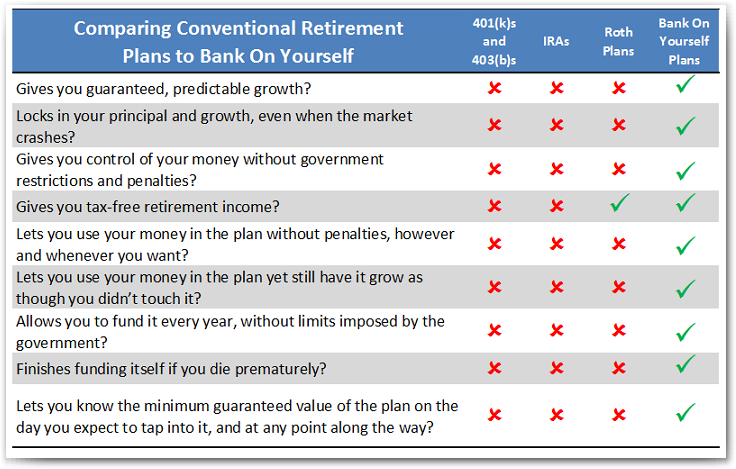 If, like most Americans, you followed conventional wisdom and have a conventional retirement plan, the answer to each of these questions is “no.” But it’s created a nice retirement plan for your broker or money manager! Would you like to find out what your bottom-line guaranteed numbers and results could be if you added the Bank On Yourself method to your financial plan? It’s easy to find out when you request your free Analysis here.